Applicability of Section 188: Section 188 Related to related Party Transaction applies to Both Public Limited and Private Limited Companies. It means a transaction between two unrelated parties that is conducted as if they were unrelated, so that there is no conflict of interest. (i.e.) there is no need to put any interest by any party in such contract by any way. In short, there is no interest in any contract; such contract automatics cover the meaning of Arm Length Transactions. The ultimate scope of this section is “interest”, if any interest is there by anyway the Section shall be effective, if there is no interest is there, the section shall be in neutral. All Companies must get Board’s approval irrespective of the Capital of the company or value of the transaction. The Approval Should be sought at a duly convened Board Meeting. All the directors of the Company including the “Interested Directors” (Related parties to such contract) can participate in the Board Meeting. But the Directors who are related to the contracts which are going to be discussed in the meeting shall not be present at the meeting during the discussion alone. The Directors who are related parties to such contract or agreement cannot vote for the same. The Quorum for the Board Meeting where Related Party Transaction is discussed should form 2/3rd majority excluding the Interested directors. For example, X Ltd is having 6 Directors in which 2 directors are related parties. When the Board Meeting is held and the Quorum for the Meeting should be (6*2/3= 4). Therefore excluding the related parties, the rest of the directors fulfilled the quorum and so meeting was held. Turnover or net worth shall be on the basis of the Audited Financial Statements of the preceding financial year. In case of wholly owned subsidiary, the special resolution passed by the holding company shall be sufficient for the purpose of entering into the transactions between wholly owned subsidiary and holding company. The Section will not apply to transactions entered by the Company in its Ordinary course of business, on arm’s length basis. The term “Ordinary Course of business” will cover the usual transactions, practices and customs of a business and of a Company. any other information relevant or important for the Board to take a decision on the proposed transaction. shall disclose the nature of his concern or interest at the meeting of the Board at which the contract or arrangement is discussed. any other information relevant or important for the members to take a decision on the proposed resolution. Every related party transaction or contract shall be disclosed in the Board’s report along with the justification for entering into such contract or arrangement. Every company shall maintain one or more registers in Form MBP 4, and shall enter therein the particulars of contracts or arrangements with a related party with respect to transactions to which section 188 applies. Any contract or arrangement entered into by any Director or any other employee, without obtaining the consent of the Board or approval by special resolution in the general meeting and if it is not ratified by the Board or, as the case may be, by the shareholders at the meeting within 3 months from the date on which such contract or arrangement was entered into, then in case if such contract or arrangement is entered with related party to any director, or is authorised by any other director, the Directors concerned shall indemnify the Company against any loss incurred by it. 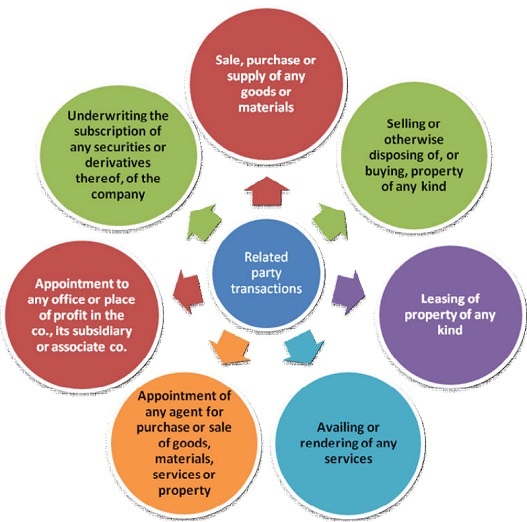 No Central Government approval is required for entering into any related party transactions. No approval of Central Government is required for appointment of any Director or any other person to any office or place of profit in the Company or its Subsidiary. The Company can take necessary actions against any Director or employee in case any transaction is entered without the consent of the Board or Company for recovery of any loss sustained by it. (i) In case of Unlisted Company, be punishable with fine which shall not be less than Rs.25,000 but which may extend to Rs.5,00,000. (ii) In case of Listed Company, be punishable with an imprisonment for a term which may extend to 1 year or with fine which shall not be less that Rs. 25,000 but which may extend to Rs.5,00,000, or with both. A company X having director A & B enters into a transaction (non Ordinary) with a company Y with Director C & D. Company X & Y are related. A & B are Interested in the contract as they hold more than 2 % in company Y. Now as they are interested director they cannot participate in a meeting in which such contract with related party is held. As there are only two directors they cannot give consent on the contract. How will the company approve such transaction. Will passing Special Resolution suffice or there is any other way. This article is not updated with the amendment in Rules. Regarding stipulation of Quorum in the Board Meeting , would you mind to inform from where you have got that provisions ? Sec 188 of co’s Act,Related party transactions casts a very wide net.Its an Auditors nightmare. Commendable article. Can u pl clarify, how resolution will be passed if 2 persons are the only members and only directors of a Co. and appoint any related party to any office or place of profit in the Co. at a monthly salary below 2.5 lacs? The statement that, shareholders approval will be required, if the PSC of the Company is more than 10 crores is inappropriate as there was Amendment on 14.08.2014 which removed the limit of 10 crores and increased the threshold limit. If we are sending Excisable As such Inputs under rule 4(5) CCR 2004 to a related party. This sec 188 of CA 2013 will applicable or not?